Joe stood tall & still before the others. Including Banner Bob & Pavi. He looked down to see her waving & saying hello to him. & even approached him a little. Joe, uneasy about new faces, turned to both Betty & Banner. "Go on, Joe. Say hello." <; ) Banner said to his giant patient. As the hulking man soon turned back to Pavi to give her a friendly wave himself. "Hel.....lo." He finally managed to say! Pavi smiled as she saw Hulk waving back at her. The massive Joe eventually turned his head to the others, including Nigel & Bob. He eventually turned to every single one of them & waved slightly. "Pav..i.....Hel-lo.....Ni-gel....Hel-lo.....Bob....Hel-lo." Joe then replied with a slow & deep tone. "N-nice to meet you." <83 Pavi says with a hand extended for a handshake. Joe soon looked down to see that Pavi was extending her hand for a friendly handshake. Though her hand was indeed much smaller then his it didn't stop Joe from attempting to shake her hand back. "Nice....To meet...you too...Pa-vi." he slowly said. Nigel walked up, "Welcome to Prehistoric Park Mr Fixit." =) he says with a smile. The large man looked down at Nigel the moment he welcomed him. From there, Joe looked back up to turn his head from side to side. Having an early look around. "Hmhm, I think Joe's excited to be here." <; ) Banner soon said. "He seems to like it so far, honey." <=3 Betty says as she stood next to Banner. "Well only one way to make it better. How about a tour." Banner soon said before he turned to Joe to see what he thought of such an idea. "What do you say Joe? Do you want to look around?" <=) he asked. As Joe Fixit slowly nodded his head in approval. "Very well. A tour it is then." =) Nigel says as he soon began to lead the way. With that, Banner & Joe Fixit began to follow Nigel Marvin & the others to begin the tour. Joe stayed close with Banner & Betty, his two closest doctors & friends. Nigel lead the way as they would follow a long pathway. The first enclosure would come into view soon. But first, the group hear rumbling sounds, of what seemed to be large animals on the move. O.O Pavi looked around, "What was that?" she asked. "Hmhm, must be one of the Titanosaurs. They roam free around the park." Nigel says. Soon enouugh, a large sauropod came from the clearing. 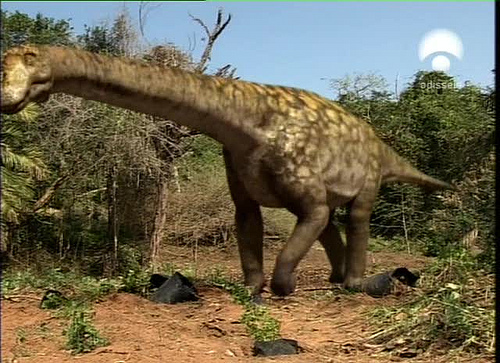 It was a Titanosaurus, a type of Cretaceous sauropod. It normally would be found in the herd that lives here, but this one is a female, & she stops, looking down at Nigel & the others. "This is Martha. She's one of my fighting dinosaurs." Nigel says. "We have another Martha here, only she's a Woolly Mammoth." X) says Bob. Banner & Joe soon stopped with the others to observe the first dinosaur that they have seen so far. Banner himself was quite imptessed of the dinosaur & the fact that Nigel had it for JFC fights. "Most impressive. So your into the JFC fights as well?" he asked. "Ys, I am." Nigel says as he hears Banner. Martha looks down at everyone with a friendlly grumble, like she was greeting everyone. But he looked over to see Hulk himself! o.O She lowers her head in front of him & sniffs him, not seeing a person like him before. Joe Fixit looked up to see the large Titanosaurus looked down at him with curiosity. He himself looked back with a similar look & with a tilt of his green head. Wondering why the dinosaur was looking at him so. But eventually, he reached his hand up to pat the dinosaur's head. "Good...Dino...saur." he said slowly. Betty smiles as she reached to a patch of cycads & hands them to Joe, "Here, Joe. Feed her." <;3 she says. Joe looked down, seeing Betty holding a small handful of cycads & plants to him. He slightly gave a tilt of his head. As this was the very first time he was offered to feed a dinosaur. He gently took the plants from her hand & thus turned back to the giant Titanosaur. From there, he began to slowly hold his large, green hand out. "There you go, Joe." <=) Banner soon said with Betty as well. <=3 Betty smiled with Banner as she watched Hulk feed Martha. Martha looked on at the branch of cycads before him for a moment. Then, she lowered her head & began to gentlly eat the plants from Joe's hand. "Hehehe, awwwwww. That reminds me of Jurassic Park." <X3 Pavi said. Banner, seeing this, couldn't help but to smile as well. The fact that he saw his patient in a state of peace & calmness, made him feel very relieved & happy he brought him along with him & Betty. "Having fun Joe?" <=) he came to asked, as Joe soon gave him a nod back. "That's good." <=3 Betty says with a smile. But soon, something came to Martha as she began huffing & puffing. & soon, she sneezes! But not on Joe, she had turned & sneezed all over Pavi! O~O Poor Pavi looked on as she was sneezed on by the titanosaur, "EWWWWWHEHEWWWWW!!!! YUCK!!!" >~< she says, shaking her hands. O.O "Martha, girl. That wasn't nice." <X) says Nigel with a chuckle. "T-thanks." >~< Pavi says, taking the towel & wiping herself clean from Martha's sneeze. "What are you two giggling at?" >=3 Pavi asks both Joe & Banner with her hands on her hips. Banner & Joe both had a good laugh together. Upon seeing Pavi looking on at the two, they soon stopped. "Hmhm, oh nothing." X) Banner said back. "You'd better not be laughing at me." >=3 Pavi says with her arms crossed, tapping her foot. O.O "What? It was funny, is all." X) Banner thus replied back. While still lightly chuckling.